The module adds a new interesting feature on your site. 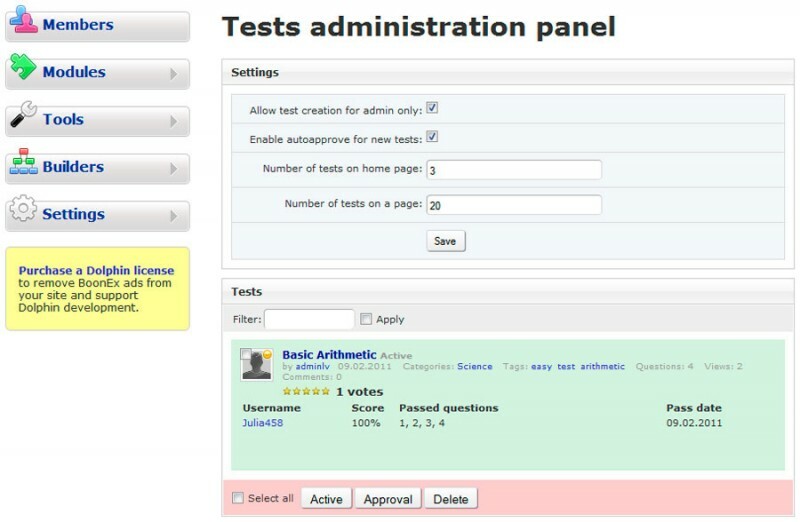 It will allow you(as administrator)and your users to create tests with multiple questions(See Images 2 and 3). Each test may have any number of questions and in the same time each question(See Image 4) may have one or more correct answers. Answers might be given to user and he needs to select correct one(s) using options or check boxes or he needs to write a correct answer in text box. Statistics of already passed tests are stored in the database and available for both common members(See Image 5) and admin(See Image 6). By default test creation is available for admin only, but if you want that your users may test each other you may easily disable 'Admin Mode' in Smart Tests administration panel(See Image 6). If the 'Admin Mode' is disabled you may use 'Autoapprove Mode' if you don't want to approve each newly created test manually. The module has different browsing capabilities(see Image 1) including a block with the most resent tests on home page. 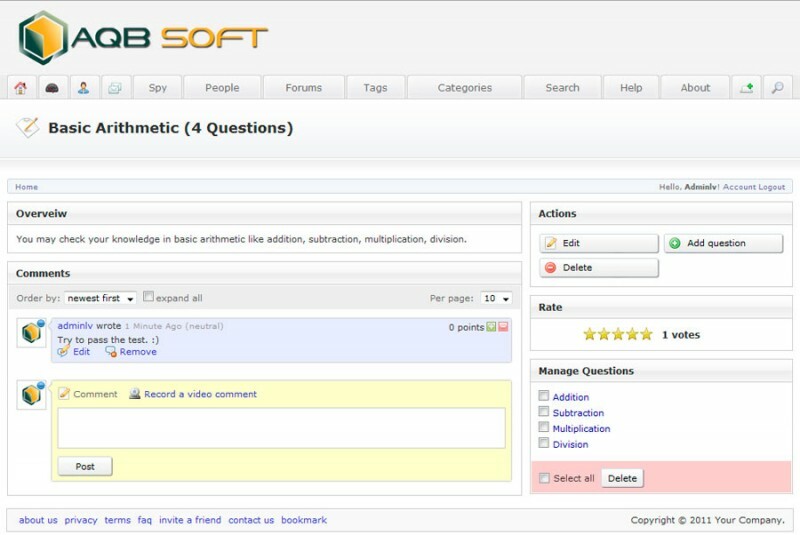 User friendly layout of test and question pages. Browsing capabilities- Latest Tests.- Top Tests.- Most Popular Tests.- Browse tests by categories.- Browse tests by tags.- Browse tests by creation date in standard Dolphin's calendar.- Using search by keyword. User may leave his opinion about the test using comments seaction (See Image 3). Votes to increase rating of an interesting test and move it up in the TOP (See Image 3). Privacy to manage access(view, vote, comment, pass) to a test between different groups of members. Admin mode to allow test creation to administrator only. Premoderation with autoapprove mode(Useful when Admin Mode is disabled). Answers history. Now tested person may look through passed test and compare his answers with correct ones. The abbility to postpone some question and return back to answer it later. The abbility to postpone answering the whole test and return back later (See Image 4 -> "Answer Question" block). Members will see a list of Postponed tests on Profile Tests page. Countdown Timer. You (as test creator) will be able to specify limited time for a test. Tested person will see a countdown in real time answering questions. (See Image 4 -> "Information" block). Countup Timer. If the test was created without time limitation. Then tested person will see countup time which will help him to relize how much time he is working with a test. Question review from test owner. It will be displayed to a tested person when he answer a question. You may test our mods, plug-ins and modules on our demo sites http://www.dolphin70.aqbsoft.com and http://www.dolphin61.aqbsoft.com And if you have some questions feel free to ask. Note. If you are interesting in similar module (app) for UNA, feel free to take a look at our Quizzes app which is fully compatible with the latest version of UNA script. I ussually don't review modules just to be nice. But I can tell you this is a vast improvement from the first. I think the addition of test view, pass, delete, and create in the membership control panel is an excellent addition. With regard to the review, it is good, but I consider it a work in progress. Ultimately, it would be ideal for a user to have a review for each answer, not just for the test as it is right now. 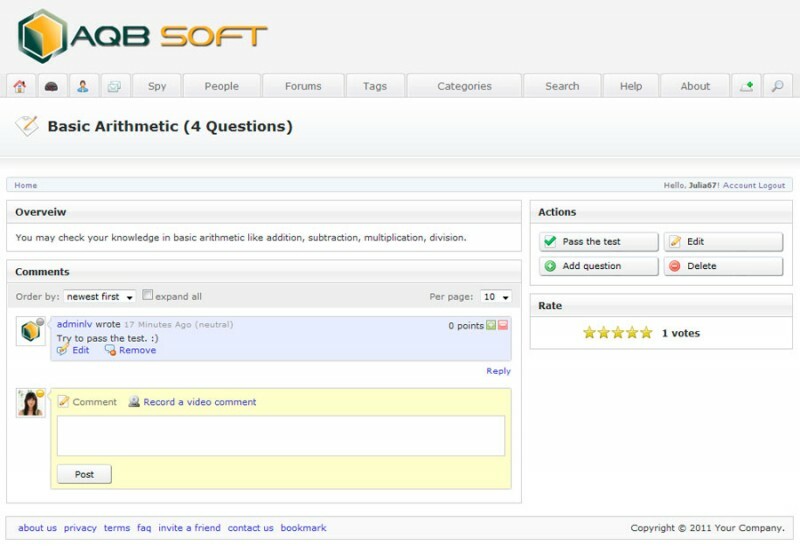 For instance, when a test creator is adding an answer, you could add a review see more box below the answer box. That way, the review will show after each answer when the user completely finishes a test!!! Great job!!!! Outstanding customer support!!! About Review feature. It's available for each question in version 2.0 and higher. If Review field is filled in during creation of a question it will be displayed in Dolphin's standard popup window after the answer was accepted from tested person. If the Review is empty then the popup is not displayed after accepting an answer. In this case you may see only one which is displayed after the test was finished. I just bought this product and read the Read me file. 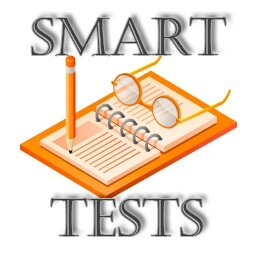 It says that Smart Tests can be used only on one domain. The thing is that my Dolphin is on a demo site right now. So, if I use Smart Tests on current domain will I be able to use it on another domain, on which I will officially host my Dolphin? Looking forward for your response? Sure you may use it on demo (dev) site and on live site at the same time. You cannot use it on a number of live sites if you purchased only one license. AntonLV accommodated a feature I needed in this module. 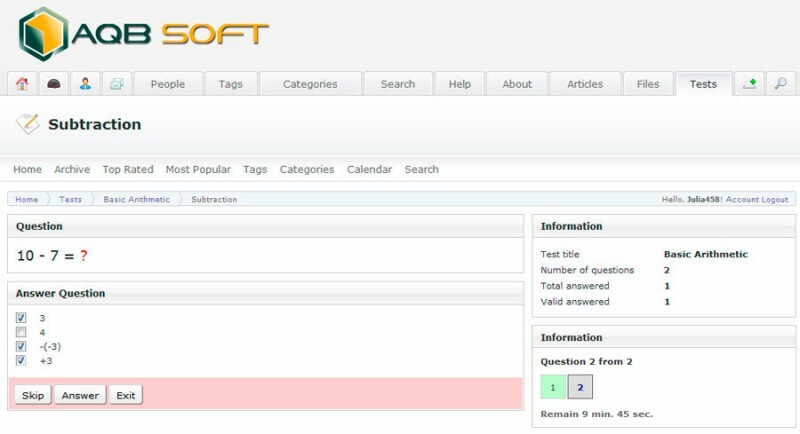 Allowing the test creator to view the answers of the test takers. Now mod performs beyond expectations and so does the responsive of the developer. I rated it 4 stars would have gotten 5 if I could have rearrange and edit answers without deleting. Awesome mod! Thank you much.